Now with Button Cuffs and Pocket. We have been asked for a long time now to make our Cooler Cowboy Shirt with button, cuffs, pocket and body fabric collar. 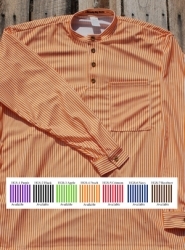 Soon Fully Available in five different color combinations with a vertical stripe pattern, Stripe Collar and Four Button Placket. 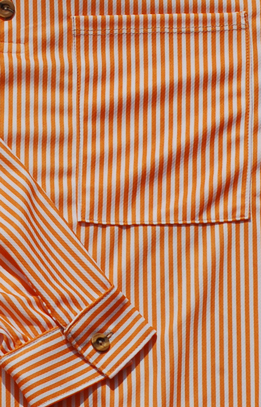 Performance poly fabric is high-wicking, super breathable and doesn't retain odors. J. Hornaday Cooler Cowboy Henleys are 100% Made in the USA. I wear the Cooler Cowboy shirts almost exclusively now. Just purchased two of the new shirts with Button Cuffs and Pockets prior to shooting the SE Regional. Shirts were very comfortable and I had a lot of compliments on how well they looked. My Husband, (Darlin Dave), David has 3 Cowboy Cooler Shirts and now with this newest offering he has 5. He wears them exclusively! Now that he has 2 of the newest Cowboy Cooler Shirts in red stripe and Navy Blue Stripe, they quickly became his FAVORITES! Good comfort and easy to wash ....just machine wash, then hang to air dry!